Powers/Abilities: After passing through the Terrigen mists, Alaris developed super-strength to an unknown degree, heightened speed and reflexes, and bulletproof skin. The extent of his abilities remains unknown. History: (Inhumans V#1) - Alaris participated in Inhuman sports competitions on the moon with his friend San. During one such game, Alaris threw a ball too far and San jumped for it, having to be rescued from the low gravity by the flying Tonaja. Later, Alaris and San stood next to each other, prepared to enter the Terrigen mists, which would unlock their true genetic potential. Alaris assumed that San would be built for better things, and so said a sentimental farewell. After emerging from the mists, he had grown in size and strength, while San had grown smaller and more deformed. Alaris was quickly appointed to the royal guard, and started training immediately, not seeing much of San. (Inhumans V#2) - Alaris was selected alongside San, Nahrees, Alaris, and Tonaja to become foreign exchange students for a year on Earth. Medusa informed them of this mission with Black Bolt standing by. The next day, the selected students, with Medusa and Carthus, listened to human ambassador Mitchell Abrams, tell about Earth, though they mostly talked through his speech. (Inhumans V#3) - While on the rocket flight to Earth, Alaris sat next to the ship's pilot, bonding and discussing his excitement to experience Earth culture. The Inhumans landed in Florida and their pictures were taken by photographers, then took time to adjust to the atmosphere difference. Alaris eagerly entered the new atmosphere, causing him to throw up. They then traveled to Madison, Wisconsin, and were shown to their new home on fraternity row. Alaris jumped into his new culture, interrupting a protest against the Inhumans, and chose to go back when a grapefruit was thrown at him. Alaris enthusiastically recruited San to go shopping with them, even though they hadn't talked in some time. Alaris took a credit card and ended up, with San, in a CD shop. He listened to Nellyville, and was impressed. Alaris interrupted a group of humans, including Chad, who were accosting San, and convinced them to take them back to their apartment, where they listened to music for hours. On their walk home, San berated Alaris' enthusiasm and pointed out their differences from humans rather than their similarities. San then stated that he hated what they'd both become, but especially Alaris, and walked away. (Inhumans V#4) - While preparing for his first day of class, Alaris had conflict with Nahrees over sharing the bathroom. Alaris walked the streets, examining cars and trying to buy a hot dog. He was told he needed to take cash from an ATM machine, but couldn't figure out how to operate it. Three young men, Brett, Scott, and Myatt, offered to teach him about culture, and to help him spend his money properly, and Alaris was thrilled to meet some friendly humans. They did much shopping and bought drinks at a bar, leaving all the patrons Alaris was buying for to cheer him on. Alaris brought home his dozens of purchased items, leaving Tonaja to question him and San to scoff him. Dean Jeremy Markley came to the door, informing them that Nahrees had destroyed a city bus with her powers and that Alaris had tapped out their credit limit. (Inhumans V#5) - Medusa contacted the students, angry and disappointed in their actions. She informed them that Dean Markley was finding them all jobs to help work off their debt. She also let Alaris know the authorities had been contacted to find Brett, Scott, and Myatt. Alaris was assigned to work with the ground crew, and did heavy labor for Lisa and her companion. While working, he saw Brett and Scott drive past in the car he'd bought them. He tried to pursue them, but they sped away. Tonaja and Nahrees later got into a fight over a broken mirror, and Alaris had to break them up, though Nahrees shocked him when he accused her of being guilty. (Inhumans V#6) - Tonaja and Alaris talked about the conflict the Inhumans were having, and Tonaja informed Alaris that Dean Markley had asked her to give a speech to the student council. Alaris went to work, volunteering to pull the gardening truck when it broke, an act that caused Jolen to wonder. While watching Tonaja give a speech in front of the student council, a girl passed Alaris a note that said he was cute. (Inhumans V#8) - The Inhumans' students attended a meeting of international students, where cultural diversity was discussed, but they didn't quite fit in. On their way back, Alaris noticed a poster stating that Brett, Scott, and Myatt were missing, and Tonaja surmised that they were still fugitives. Later, Richard Anderson, representing Haller Industries, offered money in order to study the Inhumans' genetic makeup, but Tonaja refused, even after learning human lives were at stake. San tried to confide in Alaris, but Alaris was distracted by a football game and decided to go try out for the college team. Alaris had an impressive tryout while players such as Hanley and Beery looked on. The coach agreed to sign him on, after ensuring that Alaris wasn't taking performance enhancers. Too enthusiastic during their first practice, Alaris accidentally injured player Mackenzie. The coach decided to make Alaris the team mascot instead. 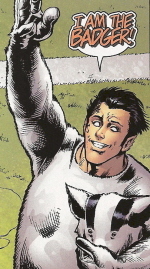 (Inhumans V#9) - Alaris performed as 'The Badger' at his first football game, and, dressed in his mascot costume, waved at Tonaja, Jolen, and San in the stands. Alaris checked in with Tonaja the next day and she asked him if he thought she was ugly. She described how she used to feel prettier, and Alaris promised to take her out soon to get her mind off of things. (Inhumans V#10) - Alaris and Tonaja, who wore human clothes for the first time, went out among the people. Neither of them enjoyed the loud nightclub, so they left and talked about culture, then played Frisbee in the park. Alaris offered Nahrees a rose, and she felt much better. Tonaja thanked Alaris, who almost kissed her, but Jolen interrupted when Narhees' friend, Ellen, informed them she'd been kidnapped. (Inhumans V#11) - Medusa was furious to hear about Nahrees' capture, and she ordered the students to find and save her, giving them Nahrees' location. Nahrees' friend Ellen drove them to Chicago, and they hoped they weren't too late to prevent her death. Upon arriving at Haller Industries, the Inhumans rushed inside after Jolen interrogated scientist Dowlati, and found Nahrees. Mister Chase, a hitman, shot Jolen in the head. (Inhumans V#12) - Chase shot Alaris, who was resistant to the bullet. Alaris picked Chase up, and Chase shot him in the throat, then the head, knocking Alaris out. Tonaja leaped on him, disarming him, while the scientist Dowlati stopped Myers from hurting Nahrees. San, with Haller and his son, entered and San stated that he agreed to give his life so that Haller's son could live. Then Jolen, revived, shocked them all by murdering Chase with roots through the abdomen. Tonaja then freed Nahrees, who was tempted to kill Haller, but Tonaja stopped her. The F.B.I., including Agent Scott Forbes, then arrived and arrested Haller. The Inhumans were free to leave. Alaris later talked to Tonaja, who informed him that she would like to be his best friend, but not romantic interest. He agreed. (Silent War#4) - Alaris joined several Inhumans in attacking the Pentagon, to release captive Inhumans (Gorgon, Jolen, Kurani, and Nahrees) and the stolen Terrigen Crystals. Other Inhumans attacking included: Black Bolt, Crystal, Lockjaw, and Somnus. The captives and Crystals retrieved, the Inhumans returned to the moon, leaving Black Bolt behind to defeat the Avengers. (Silent War#5) - The Mighty Avengers (Ares, Black Widow (Natasha Romanova), Iron Man (Tony Stark), Ms. Marvel (Carol Danvers), Sentry, Wasp, Wonder Man) arrived to stand against the Inhumans. Comments: Created by Sean McKeever, Matthew Clark, and Nelson. 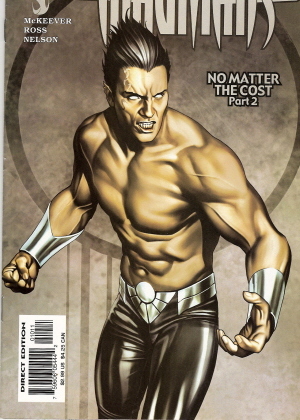 An Inhuman named Alaris was seen in Inhumanity#2 (March, 2014), but he looked nothing like the Alaris known from Inhuman V and Silent War. 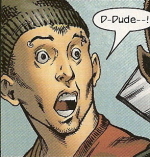 (Inhumans V#3) - While shopping in a CD store, Chad and his friends saw San of the recently arrived Inhumans' exchange students. They demanded San get out of the store and the country, and may have gotten violent, but the stronger Alaris intervened. Alaris and San coerced Chad and his friends into taking them back to their apartment, where they listened to CDs for hours. (Inhumans V#4 (fb) - BTS) - Residents and students in Madison, Wisconsin, Brett, Scott, and Myatt conned a Saudi exchange student into spending much of his money on them. (Inhumans V#4) - Out of money the first week into the semester, Brett, Scott, and Myatt decided to take advantage of another exchange student, this time Alaris of the Inhumans. They manipulated him into shopping and buying drinks for everyone. (Inhumans V#5 - BTS) - Brett, Scott, and Myatt's actions were reported to the police. (Inhumans V#5) - While driving in their new car, Brett and Scott were pursued by an angry Alaris, but they sped away. (Inhumans V#6) - After leaving a bar, Brett, Scott, and Myatt were beset by the Inhuman Jolen who murdered them and buried them in the ground. (Inhumans V#8 - BTS) - A missing poster was hung regarding Brett, Scott, and Myatt. (Inhumans V#5) - Working on the grounds crew at University of Wisconsin-Madison, Lisa directed Inhuman Alaris where to move a gazebo. Then, while having him move a large rock, Alaris rushed off unexpectedly. (Inhumans V#8) - When the Inhuman Alaris came to try out for the University of Wisconsin-Madison football team, player and student Hanley came to inform the coach, who was ranting about modern super-heroes. Alaris gave an impressive tryout and was accepted on the team, but when his strength was too great they moved him to the mascot role instead. 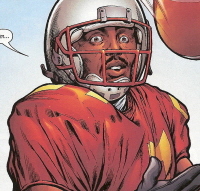 (Inhumans V#8 - BTS) - Quarterback of the football team for University of Wisconsin-Madison, Beery was present when Alaris of the Inhumans tried out for the team. He apparently had a reputation, among the coach at least, of being a whiner. (Inhumans V#8) - A football player for the University of Wisconsin-Madison, Mackenzie was injured by the Inhuman Alaris, who was trying out for the team.